Amidst all of the snow everywhere and the freezing temperatures, yes, even still here in The Deep South, my Meyer lemon tree is in heavy bloom. It is really more like a shrub than a tree - and a leggy shrub at that - because it is in a planter. I want to say that it is going into its third year of growth for me. Meyer lemon trees do not like low temperatures, and will, in fact, go dormant at 54 degrees, so I move mine in and out of the house anytime the temperatures are cold. Needless to say I have been moving it in and out alot here lately, and it has paid me off with early blooms. In fact, this is the most I've seen it bloom since I purchased it, though last year it also had a lot, maybe half of this, but they simply dropped off and did not produce fruit, or if they produced fruit, many just fell off right away. I'm thinking that it was likely a pollination issue, so I've already broken out a paintbrush to move these blooms along, since there won't be any bees around for awhile yet, and certainly not inside! You can fill a thimble with what I know about Meyer lemon trees, so I have no idea what might have happened last year, but I do hope that with this nice start, I might actually have a few pretty lemons to show off to you later this year! For now, I am enjoying the unique perfume of these pretty, delicate blooms. Ooooh a Meyer lemon tree! 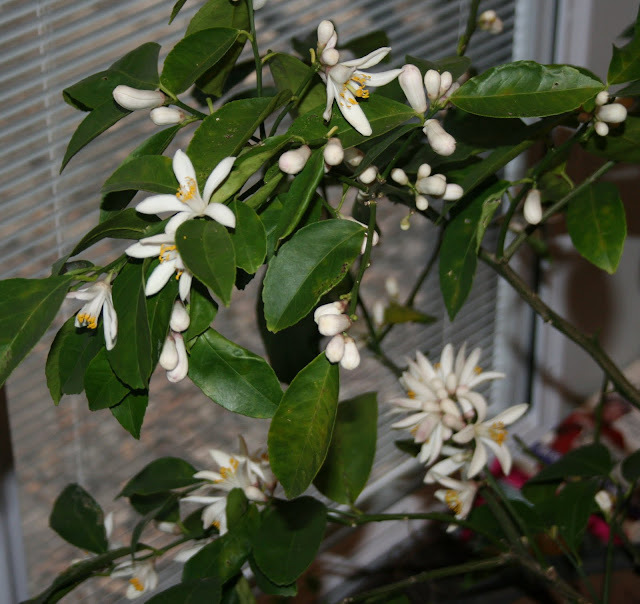 Whats funny is I JUST NOW noticed our orange blossoms budding on our tree outside! We've had warm weather lately so I think that brought them out. (but it also seems the landscapers picked some of the pranges, grrr!) They are just about ready to eat without any sourness. Beautiful blooms Mary. what a welcome vision. The cold weather can really be depressing. That is so cool that you get to have a lemon tree where you live! I had no idea. Those blooms are really pretty. I hope all the moving pays off and gives you beautiful lemons soon. Spring IS just around the corner. I can feel it. I'll bet it smells delicious!!! Can't grow them here in northern Utah. 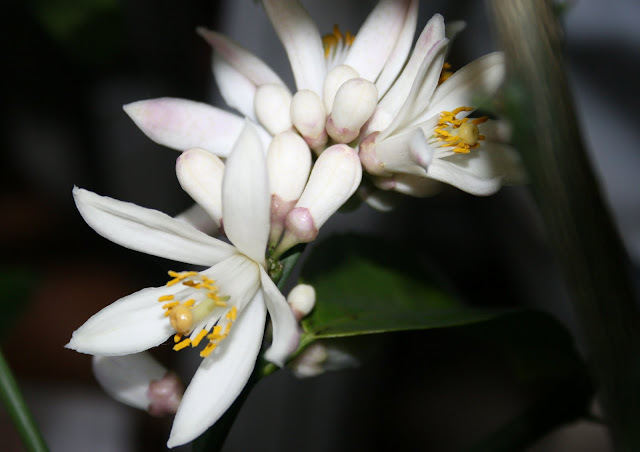 Can't grow LOTS of stuff I grew in California, but I really miss the gardenias and azaleas and the citrus trees. Enjoy!! !